The lift is inconspicuous to the eye, and most onlookers would be unaware of its presence, unlike traditional large, bulky ramp systems. The small, cost-effective lift comes in 3 sizes that are adjustable to span one and up to five steps, and can be painted to blend with any house style and exterior. 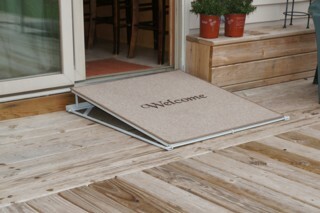 For structures with thresholds of 1” to 8”, ConvertaStep also makes the "Welcome Mat Ramp.” When not in use, the carpet covered ramp lies flat and serves as a door mat. 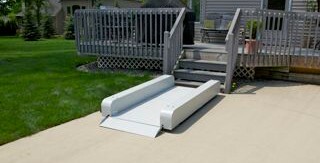 This ramp comes in a manual or a powered version that operates with a wireless remote. Simply pull a lever or push a remote button and the door side of the mat raises to make a ramp. The durable ramp surface is covered with a variety of carpet colors for an attractive style. The user then pulls forward under the steering wheel into the driving position. The DMS lift enables you to drive from a truck or SUV without having to transfer from your wheelchair. You no longer have to drive only lowered floored vans. You have a choice. The frame, rocker panel, threshold and fuel tank are not modified. The proprietary door openers and closers operate by air. The factory door can easily be opened manually. Emergency backups for hydraulic and electrical failures. The mission of ATC is to supply customers an exceptional product that provides a truly unique life changing experience through mobility with style. ATC conversions are developed through a team effort that ensures the highest quality design for manufacturing, efficient assembly processes and competitive costs and services. You can drive a truck from your wheelchair! We have the wheelchair lift for trucks or SUVs that will work for you!